Father Jacques Ghazir Haddad was born on February 1, 1875, in Ghazir, Lebanon, the third of five children. He studied Arabic, French and Syriac at the College de la Sageese in Bierut. In 1892 he went to Alexandria, Egypt to teach Arabic at the Christian Brother's College where he felt the call to priesthood. The following year he entered the Capuchin Convent in Khashbau and was ordained a priest on November 1, 1901. Father Jacques dedicated his life to preach the Word of God, and rescue the poor, the orphans, and the handicap. His vocation was matured through his experience in life and his skills as a teacher which helped him understand the difficulties and struggling of the Lebanese family during the turn of the Nineteenth Century. By 1910, he had opened 230 schools for 7,500 students. Father Jacques walked all over Lebanon proclaiming the Word of God as an itinerant preacher from 1903 to 1914 and was given the name "the Apostle of Lebanon". He was also seen preaching in Syria, Palestine, Iraq and Turkey. He built a chapel dedicated to Our Lady of the Sea and erected a great Cross nearby. Fr. Jacques was willing to help anyone in need following in the footsteps of Saint Francis of Assisi. 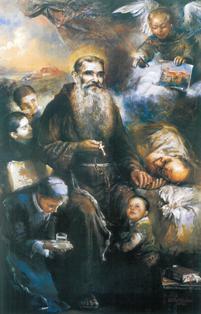 With the help of his brother Capuchins and other helpers, he organized 15 soup kitchens and started 24 orphanages. He also founded the Franciscan Sisters of the Holy Cross of Lebanon to assist him in this mission. Father Jacques died on June 26, 1954 in Lebanon. He was beatified on June 22, 2008, by Cardinal Jose Saraiva Martins, C.M.F., Prefect of Congregation for the Causes of Saints. God our Father, You take care of the humble and are far from the proud. May the example and intercession of the Blessed Jacques help us to avoid pride and grow in humility on the road which leads to You. We ask this through our Lord Jesus Christ, Your Son, who lives and reigns with You and the Holy Spirit, one God, for ever and ever.